The reference value allows the comparison of the exposure of individuals or population groups with the background exposure. Since environmental conditions are changing reference values are checked continuously and are updated if new information becomes available. The reference value for a chemical substance in human biological material (e.g. 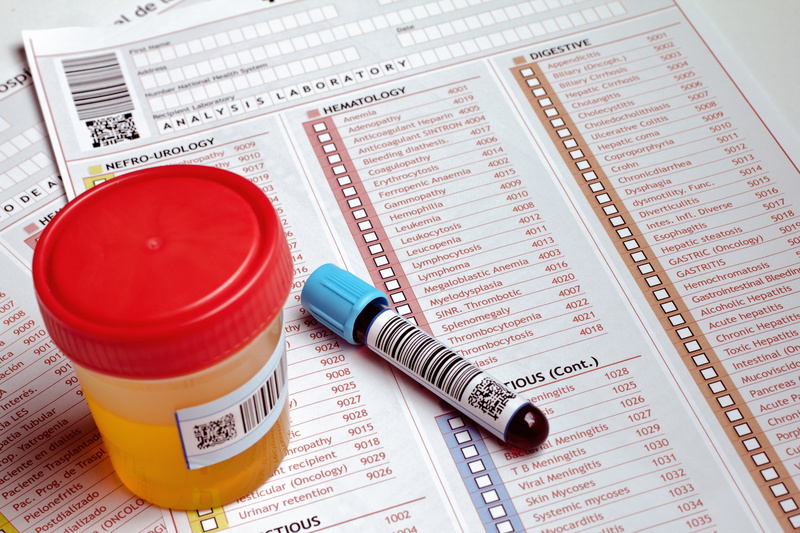 blood, urine) is derived according to a defined statistical method from a series of measuring results. Samples to be used for this purpose have to be collected from a defined group of the general population. For details about the statistical definition and calculation of a reference value see the relevant IUPAC guideline (O.M. Poulsen, E. Holst and J.M. Christensen: A supplement to the approved IFCC Recommendation on the theory of reference values. In: Pure & Appl. Chem. 69, 7 (1997) 1601-1611). 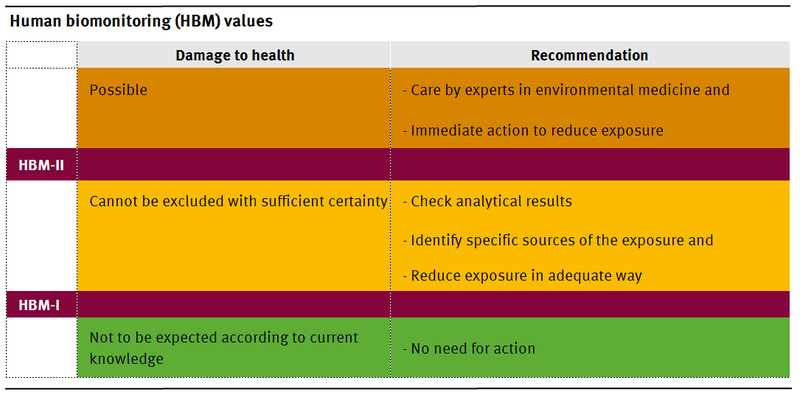 In analogy to this guideline, the HBM Commission uses as reference value the 95th percentile of the measured pollutant concentration in the relevant matrix of the reference population. To derive it, it is rounded off within the 95 % confidence interval. In addition, when the data base is appropriate and sufficient to do so, the HBM Commission defines reference values for sub-groups subjected or not to specific exposures (e.g., non smoking and cadmium in blood). Wherever possible, reference values are defined using data obtained for a suitable reference population, such as the population studied in the German Environmental Surveys (GerES). The HBM Commission has pointed out explicitly that the reference values are strictly statistically derived values, which per se are of no health relevance. Human biomonitoring (HBM) values, in contrast, are derived on the basis of toxicological and epidemiological studies. Two levels are defined: HBM-I and HBM-II. The HBM-I-value represents the concentration of a substance in human biological material below which – according to the knowledge and judgement of the HBM Commission – there is no risk for adverse health effects and, consequently, no need for action. At a concentration level higher than the HBM-I- and lower than the HBM-II-value the result should be verified by further measurements. If these measurements confirm the initial result a search for potential sources of exposure should be undertaken. Exposure to such sources should be minimized or eliminated where necessary and achievable with an acceptable level of input. The HBM-I-value should thus be regarded as a verification or control value. The HBM-II-value represents the concentration of a substance in a human biological material above which – according to the knowledge and judgement of the HBM Commission – there is an increased risk for adverse health effects and, consequently, an acute need for exposure reduction measures and the provision of biomedical advice. The HBM-II-value should thus be regarded as an intervention or action level. Up to 2014 the derivation of toxicologically founded HBM values was based on studies which allowed a correlation between the concentration of a substance or ist metabolites in human body fluids und the occurrence of adverse effects. But for numerous substances such studies are lacking. For this reason the HBM Commission decided to derive also HBM values on the basis of toxicologically justified tolerable daily intakes or other suitable parameters from animal studies. Being well aware of the uncertainties of such derivation and estimates , the HBM Commission considers this new approach a possibility to derive urgently needed HBM values for substances or their metabolites for which no appropriate studies on health effects of low dose environmental exposure are currently not available. Up to now, the Commission has derived human biomonitoring values for cadmium, mercury, thallium, PCP, DEHP, Bisphenol A, PCB , glycol ethers metabolized to methoxy acetic acid, DINCH and DPHP (publication is under way) in urine or blood.